PAL Ceramic Filter Plate is an aluminum-water foam ceramic filter, which adopts a three-dimensional network structure and an organic bubble communicating with pores as a carrier, infiltrates the thixotropic alumina slurry, and uses a four-center correction center distance automatic extrusion process. The slurry was evenly applied to the carrier’s foam body skeleton, and baked and cured at a high temperature of 1180°C. Installed in the filter box for aluminum alloy liquid impurities filter, aluminum water foam ceramic filter to meet the production of high value-added, high-tech performance aviation, transportation and other aluminum alloy precision casting. Such as: computer hard drives, printing PS base, can making materials, jet turbine engine fan blades and other products. AdTech’s aluminum water ceramic foam filter uses a three-dimensional mesh structure and an organic foam body that communicates with air holes as a carrier, infiltrating it into a thixotropic aluminum oxide slurry, and using a square-corrected center distance automatic extrusion The process is such that the slurry is evenly deposited on the foam body skeleton of the carrier, and baked and cured at a high temperature of 1180°C. Installed in the filter box for aluminum alloy liquid impurity filtration, to meet the production of high value-added, high-tech performance aviation, transportation and other aluminum alloy precision casting. Such as: computer hard drives, printing PS base, can making materials, jet turbine engine fan blades and other products. 1. Check and clean the filter box surface debris to keep the filter box clean and free from damage. 2. Gently place the filter plate in the filter box and press the seal gasket around the filter plate with your hand to prevent the aluminum liquid from flowing or floating. Preheat the filter box and the filter plate evenly so that it is close to the temperature of the aluminum liquid. The preheating temperature of the filter plate is not lower than 260°C. 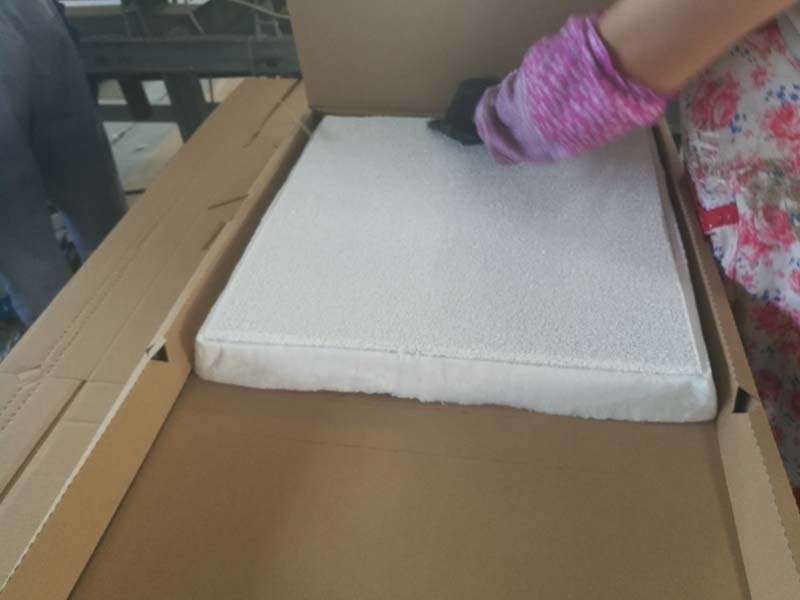 Preheating to remove adsorbed water helps to facilitate the opening of the initial filter pore size at the moment and prevents the heat from rising and shrinking to block some holes in the filter plate. Preheating can be electric or gas heating, normal heating 15-30 minutes. 4. Pay attention to observe the change of the aluminum hydraulic head when casting, and maintain the flow of normal demand aluminum liquid. The normal initial pressure head is 100-150mm. When the liquid begins to pass, the pressure head will drop below 75-100mm, and then the pressure head will slowly increase. 5. During the normal filtration process, avoid knocking and vibrating the filter plate. At the same time, the flow tank should be filled with aluminum water to avoid the perturbation of the aluminum liquid too large or too small. 6. After the filtration is completed, remove the filter plate in time and clean the filter box.